Shopping for Thor Prop Replicas? Wield the power of the Thor with this 1:1 scale role-play prop replica! Features intricate detailing, sound effects, and a light-up lightning effect! Measures about 19 3/4-inches long, with a die-cast metal pommel. "Whosoever holds this hammer, if he be worthy, shall possess the power of Thor." Worthy Marvel fans can now wield the power of the God of Thunder with this fantastic 1:1 scale role-play Mjolnir. 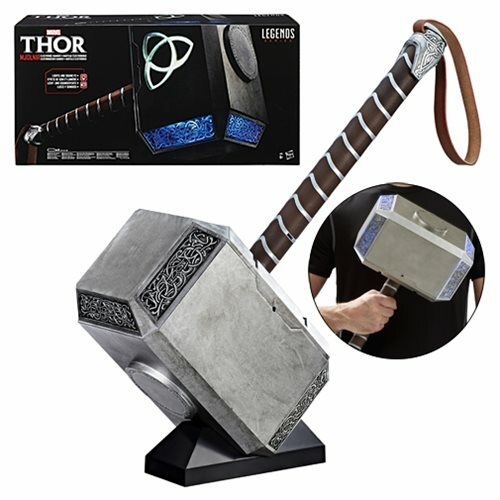 Measuring about 19 3/4-inches long, with a die-cast metal pommel, the premium Marvel Legends Thor Mjolnir Hammer Electronic Prop Replica features intricate detailing, sound effects, and a light-up lightning effect! A hidden Odin symbol illuminates when triggered by voice recognition technology. Requires 3x "AA" batteries, not included. Ages 18 and up.